This is quite a striking plant from the US which grows from a herbaceous rootstock. The foliage is long and straplike, similar to a broadleaved grass. Flowers are blue - yes blue! 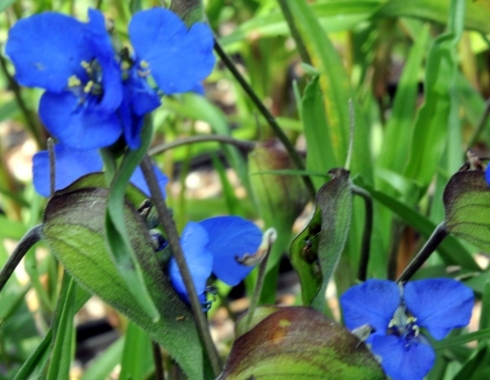 Being closely related to Tradescantia they have three petals each which are quite broad and make the flower around 2 cms wide or so. These are held in a flowerhead which appears to be on it's side and the flowers emerge from the top in rapid succession, one at a time but each plant will have numerous flower stems.